Posted on January 23, 2019 by Staff & filed under Nevada by the Numbers Blog. The Nevada Department of Employment, Training, and Rehabilitation (DETR) has released the unemployment numbers for December 2018. We’ll have a fully updated Job Flash for you before long, but here’s a quick update. Job growth month-over-month is strong, with a seasonally adjusted increase of 6,300 jobs from November to December. Carson City was the only major metropolitan center with an adjusted loss of –100 jobs. 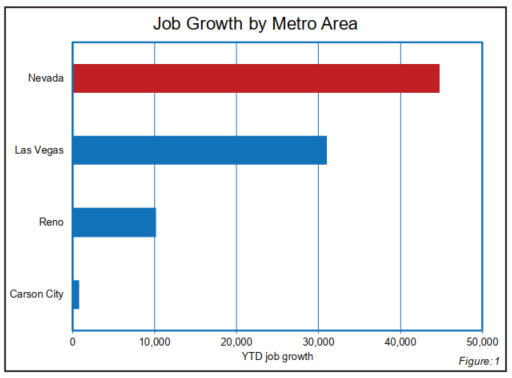 Las Vegas and Reno saw adjusted growth of 2,600 and 600 jobs, respectively. Since December of 2017, Nevada jobs have grown by 3.9 percent, or by 52,400, with a majority (35,200, 67%) obviously being in Las Vegas. For more info from DETR check out their Nevada Workforce website, and stay tuned for our December 2018 Job Flash with a deeper dive into the numbers.